When a young couple brings their baby home, disturbing supernatural occurrences lead them to confront their struggle to be parents and unlocks family secrets. When discussing family dynamics in horror, I tend to read from the perspective of the child. The horror movies with the relatively good kid who's a little weird, experiencing some paranormal circumstances that are unforgiving, or just out of place in contrast to their peers has been a diverse viewing experience that has come with some cool turns. Orphan (2009), Poltergeist (1982), Before I Wake (2016), and Child's Play (1988) are some of my favorite examples I can think of right now that fall somewhere within these descriptions. We all know what it was like to be a kid, but not all of us will experience parenthood. I like talking to parents, a lot. There's a deeply honest approach to the way in which they discuss how being a parent becomes a part of who you are; the adjustments you make, the acceptance of imperfections, the moments of pure joy as well as sheer terror that sometimes can happen simultaneously. FirstBorn looks at a work-hard-leisure-hard pair Charlie (Antonia Thomas) and James (Luke Norris) as an unexpected pregnancy is met with concern but enthusiasm. James is determined to remain dedicated to building a family and keeping Charlie happy. There are signs that something is not quite normal about their venture into parenthood almost immediately. The build-up to what transpires is what sets the tone for the film; not quite a slow burn but far from fast paced. Once their little girl Thea comes into the picture, the supernatural bursts through like the Kool-Aid man and shakes their foundation at its core. FirstBorn digs into the real life mess of questioning, being burdened/isolated by, and the despair felt when someone can't fully protect their child as a parent. The entire cast brings an energy to their performances that matches the tone of the film. FirstBorn is not boisterous in anyway. It's emotionally-driven and fueled by anxiety. Simply put, FirstBorn is England's Insidious. Not at all in filmmaking technique or style but more the similarities found in the story that mirrors the usually successful pitch of how a "charmed" child can wreak havoc on a family. But FirstBorn is not without its little twists, rituals, and creatures that keeps the story mildly interesting. It's a quiet film with a few cool, disturbing images that thrive on dread and not the gotcha scare. One of the biggest flaws is that the exposition is a bit vague, but this is where at least two viewings may be of assistance. However, there's no promise that the unfolding of the story is intriguing enough to revisit. But I do think FirstBorn is worth the time its given, and if you adore Antonia Thomas from the UK television series' Mistfits or even Lovesick, you'll definitely nod to the young actress' range and promise as a starlet. 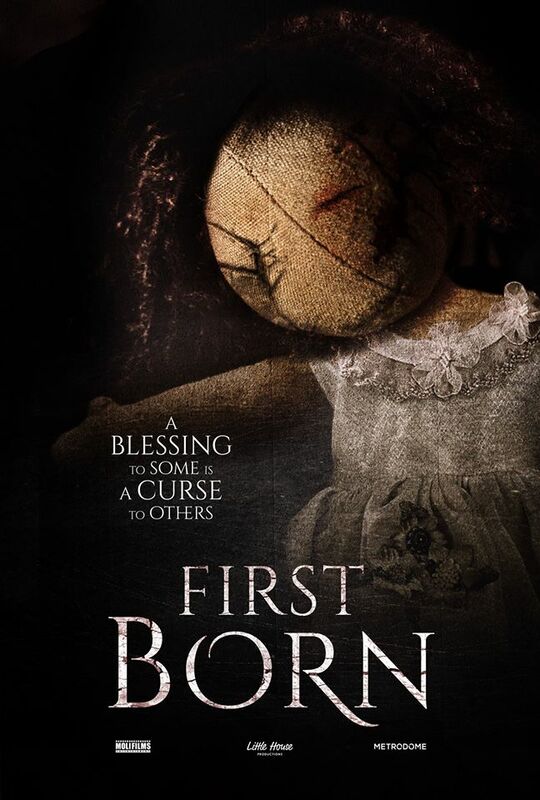 You can watch FirstBorn on Netflix streaming now.